Below please find post-season accolades for all Division I conferences (except for the not-yet-released Big Sky Conference) as well as the AVCA Division II and III All-America list for 2018. Check back regularly as we update this listing when new recognitions are released. Congrats to all the players and coaches honored for their outstanding play this fall. Sherridan Atkinson#, Purdue University, RS, Sr.
Mikaela Foecke^, University of Nebraska, OH, Sr.
Jenna Gray*, Stanford University, S, Jr.
Lyndie Haddock-Eppich, Brigham Young University, S, Sr.
Morgan Hentz*, Stanford University, L, Jr.
Roni Jones-Perry#, Brigham Young University, OH, Sr.
Kathryn Plummer*$, Stanford University, OH, Jr.
Jordyn Poulter#, University of Illinois, S, Sr.
Jacqueline Quade, University of Illinois, OH, Jr.
Dana Rettke*, University of Wisconsin, MB, So. Stephanie Samedy*, University of Minnesota, RS, So. Samantha Seliger-Swenson^$!, University of Minnesota, S, Sr.
Lauren Stivrins, University of Nebraska, MB, So. Kendall White^, Penn State University, L, Jr.
Tami Alade, Stanford University, MB, Sr.
Allie Barber, Marquette University, OH, Jr.
Brooke Botkin, University of Southern California, OH, So. Dani Drews, University of Utah, OH, So. Leah Edmond*%, University of Kentucky, OH, Jr.
Shelly Fanning, Baylor University, MB, RS-Jr.
Audriana Fitzmorris^, Stanford University, RS, Jr.
Sydney Hilley, University of Wisconsin, S, So. Mary Lake, Brigham Young University, L, Jr.
Madison Lilley^, University of Kentucky, S, So. Regan Pittman, University of Minnesota, MB, RS-So. Carly Skjodt%, University of Michigan, OH, Sr.
Ronika Stone, University of Oregon, MB, Jr.
Micaya White#$, University of Texas, OH, Jr.
Naghede Abu, University of Colorado, MB, Sr.
Kara Bajema, University of Washington, OH, Jr.
Ali Bastianelli#, University of Illinois, MB, Sr.
Madison Duello, University of Wisconsin, RS, RS-Jr.
Heather Gneiting, Brigham Young University, MB, Fr. Kenzie Maloney, University of Nebraska, L, Sr.
Nika Markovic, University of Pittsburgh, RS, Jr.
Taylor Mims, Washington State University, OH, Sr.
Blake Mohler, Purdue University, MB, RS-Jr.
Jonni Parker, Penn State University, RS, Fr. August Raskie, University of Oregon, S, Sr.
Jordan Thompson, University of Cincinnati, OH, RS-Jr.
Lindsey Vander Weide%, University of Oregon, OH, Sr.
Jaali Winters+, Creighton University, OH, Sr.
Efrosini Alexakou, St. John’s, OH, Fr. Rachel Anderson, Western Kentucky, MB, Sr.
Lee Ann Cunningham, Rice, L, Jr.
Yaasmeen Bedart-Ghani, Texas, RS, Sr.
Lauren Bruns, Dayton, OH, Sr.
Brionne Butler, Texas, MB, RS-Fr. Payton Caffrey**, Florida State, OH, Jr.
Holly Carlton, Florida, RS, RS-So. Tiffany Clark, Wisconsin, L, Jr.
Madelyn Cole, Creighton, S, Jr.
Devyn Cross, Arizona, MB, Jr.
Gabby Curry, Kentucky, L, So. Kendra Dahlke, Arizona, OH, Sr.
Kylie DeBerg, Missouri, OH, So. Ryan DeJarld, Notre Dame, L, Sr.
Sarah Dixon, Kansas State, S, RS-Jr.
Santita Ebangwese, Syracuse, MB, Sr.
Logan Eggleston, Texas, OH, Fr. Kennedy Eschenberg, BYU, MB, So. Kylie Grandy, Southern Mississippi, OH, Sr.
Serena Gray, Penn State, MB, Fr. Tessa Grubbs, Tennessee, OH, Jr.
Thayer Hall, Florida, OH, Fr. Nicklin Hames, Nebraska, S, Fr. Hollann Hans, Texas A&M, OH, Jr.
Alexis Hart, Minnesota, OH, Jr.
Kirstie Hillyer, Colorado State, MB, RS-Jr.
Kaitlyn Hord, Penn State, MB, Fr. Willow Johnson, Oregon, RS, Jr.
Morgan Johnson, Texas, MB, Sr.
Keyton Kinley, Oklahoma, L, So. Taryn Kloth, Creighton, OH, Sr.
Taryn Knuth, Florida State, MB, So. Kenzie Koerber, Utah, RS, So. Martha Konovodoff, Marquette, L, So. Rachael Kramer, Florida, MB, Jr.
Khalia Lanier, Southern California, OH, Jr.
Raquel Lazaro, Southern California, S, Fr. Nicole Lennon, Rice, OH, So. Jenna Lerg, Michigan, L, Sr.
Kayla Lund, Pittsburgh, OH, So. Kennedy Madison, College of Charleston, RS, Sr.
e’lan McCall, TCU, OH, Fr. Meghan McClure, Stanford, OH, So. Melanie McHenry, Louisville, OH, Jr.
McKenna Melville, UCF, OH, Fr. Leah Meyer, Duke, MB, RS-Jr.
McKenna Miller, BYU, OH, Jr.
Brooke Morgan, Kentucky, MB, Sr.
Taylor Morgan, Minnesota, MB, RS-Jr.
Alyssa Munlyn, Missouri, MB, Sr.
Zana Muno, UCLA, L, Sr.
Gloria Mutiri, Kansas State, RS, Fr. Charley Niego, Notre Dame, OH, Fr. Brooke Nuneviller, Oregon, L, Fr. Katie Oleksak, Colorado State, S, Jr.
Courtney Pence, Illinois State, L, Sr.
Addie Picha, San Diego, MB, Sr.
Jordan Pingel, UCF, L, Sr.
Yossiana Pressley, Baylor, OH, So. Nia Reed, Penn State, OH, RS-Sr.
Tess Reid, Loyola Marymount, S, Jr.
Wilma Rivera, Louisville, S, Sr.
Adanna Rollins, Minnesota, OH, Fr. Lindsey Ruddins, UC Santa Barbara, OH, Jr.
Molly Sauer, Louisville, L, Sr.
Jess Schaben, Iowa State, OH, Sr.
Andie Shelton, Duke, S/H, Gr. Polina Shemanova, Syracuse, OH, Fr. Mikayla Shields, South Carolina, RS, Jr.
Alexa Smith, Colorado, OH, Sr.
Jasmin Sneed, VCU, MB, Jr.
Piper Thomas, Northern Iowa, MB, Sr.
Erica Treiber, Tennessee, MB, Sr.
Jocelyn Urias, Washington State, MB, RS-Jr.
Layne Van Buskirk, Pittsburgh, MB, Jr.
Adlee Van Winden, Cal Poly, OH, Sr.
Torrey Van Winden, Cal Poly, RS, Jr.
Cortney VanLiew, FGCU, OH, So. Bryanna Weiskircher, Penn State, S, RS-Sr.
Brooke Westbeld, Dayton, S/H, RS-So. M’Kaela White, James Madison, MB, Jr.
Stephanie Williams, Pittsburgh, OH, RS-Jr.
MacKenna Woodford, Washington State, OH, Sr.
Kylee Zumach, Kansas State, OH, RS-Sr.
Jenna Bridges Hartford Jr. OH Exeter. R.I.
McKyla Brooks Stony Brook Sr. MH/OH Blasdell, N.Y.
Emily Costello Stony Brook Gr. OH Webster, N.Y.
LeAnne Sakowicz Stony Brook Jr. S Wauconda, Ill.
Chloe Evering UAlbany Jr. OH San Marcos, CA. Akuabata Okenwa UAlbany R-Jr. MB Canyon Country, CA. Gabri Olhava New Hampshire Sr. MB Mount Prospect, Ill.
Emily Tanski New Hampshire Jr. OH Plymouth, MI. Danielle Tedesco UAlbany So. MB Cazenovia, N.Y.
Kiara Adams Binghamton Fr. S/DS Peekskill, N.Y.
Paige Krenik UMBC Fr. OH Foothill Ranch, CA. Sabrina Patriciello Stony Brook Fr. L Cortlandt Manor, N.Y.
Megan Anderson Hartford So. 4.00 Biology Orono, MN. Jenna Bridges Hartford Jr. 3.55 Biomedical Engineering Exeter, R.I.
Emily Costello Stony Brook Gr. 3.51 Business Administration Webster, N.Y.
Chloe Evering UAlbany Jr. 3.98 Biology San Marcos, CA. Carmen Freeman UMBC So. 3.67 Political Science Memphis, TN. Maria Bellinger, Delaware, OH, Jr., Paramus, N.J.
Gabrielle Eyl, Northeastern, L, Sr., Leesburg, Va.
Kennedy Madison, College of Charleston, RS, Sr., Evansville, Ind. Devon Rachel, College of Charleston, OH, Sr., Louisville, Ky.
M’Kaela White, James Madison, MB, Jr., Riverdale, Md. 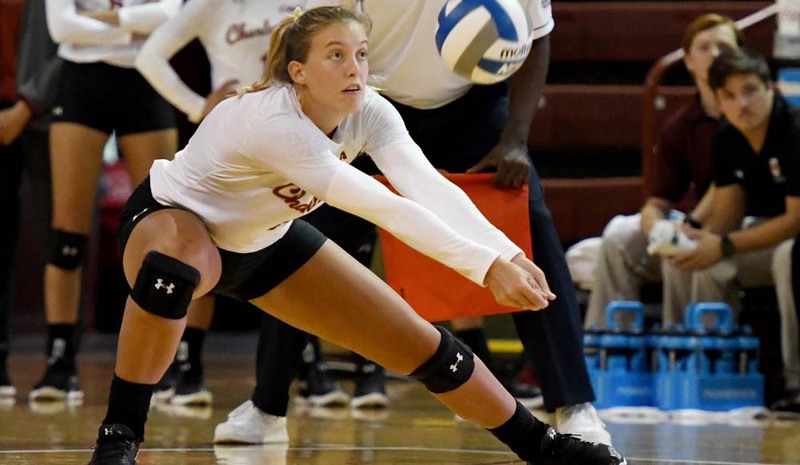 Allison Beckman, College of Charleston, S, Sr., Apex, N.C.
Anna Holehouse, Towson, L/DS, Sr., Joppa, Md. Maddy Kline, UNCW, OH, Sr., Palmyra, Va.
Sarah Martin, James Madison, S, Jr., Fort Lauderdale, Fla.
Natalie Shollin, Northeastern, MB/OH, Jr., Corona, Calif.
Kelly Vahos, James Madison, OH, Jr., Cold Spring, N.Y.
Maddie Appleton, Hofstra, L, Fr., Milford, Mich.
Claire Farrell, William & Mary, OH, Fr., Alexandria, Va.
Emily Jarome, Towson, OH, Fr., Wilmington, Del. Kellyn Trowse, Elon, OH/RS, Fr., Tampa, Fla.
Kira Porter, MB, Jr., Howard, Lake Tahoe, Nev.
Courteney Pitt, OH, So., North Carolina A&T State, Farmville, N.C.
Meraiah Hill, MB, Sr., Bethune-Cookman, Ocala, Fla.
Jurnee Tipton, OH, So., Howard, Ypsilanti, Mich.
Fola Wilson, L, So., Howard, Minneapolis, Minn.
Rachel Kayongo, OH, Sr., Maryland Eastern Shore, Northridge, Calif.
Brianna Lang, S, fr., Coppin State, Atlanta, Ga.
Mauri Carver, MB, Fr., Maryland Eastern Shore, Elizabeth City, N.C.
Zoe McBride, OH, Fr., Morgan State, Ridgefield, Wash.
Arlanda Faulkner, OH, Fr., North Carolina Central, Goldsboro, N.C.
Naghede Abu, COLO, MB, 6-4, SR, Riverside, Calif.
Kara Bajema, WASH, OH, 6-2, JR, Lynden, Wash.
Kendra Dahlke, ARIZ, OH, 6-0, SR, Bonsall, Calif.
Audriana Fitzmorris, STAN**, OH/O, 6-6, JR, Overland Park, Kan.
Jenna Gray, STAN**, S, 6-1, JR, Shawnee, Kan.
Morgan Hentz, STAN**, L, 5-9, JR, Lakeside Park, Ky.
Khalia Lanier, USC***, OH, 6-2, JR, Scottsdale, Ariz.
Meghan McClure, STAN, OH, 6-0, SO, Rancho Santa Margarita, Calif.
Taylor Mims, WSU**, OH, 6-3, SR, Billings, Mont. Kathryn Plummer, STAN***, OH, 6-6, JR, Aliso Viejo, Calif.
Alexa Smith, COLO**, OH, 6-1, SR, Colorado Springs, Colo.
Ronika Stone, ORE**, MB, 6-2, JR, San Jose, Calif.
Lindsey Vander Weide, ORE***, OH, 6-3, SR, Turlock, Calif.
McKenna Woodford, WSU, OH, 6-4, SR, Chandler, Ariz. Honorable Mention: Preslie Anderson, California; Emily Baptista, USC; Ashley Brown, WSU; Devyn Cross, ARIZ; Brianna Doehrmann, UTAH; Alyse Ford, ASU; Lauren Forte, CAL; Madeleine Gates, UCLA; Willow Johnson, ORE; Kenzie Koerber, UTAH; Raquel Lázaro, USC; Brooke Nuneviller, ORE; Mima Mirkovic, CAL; Zana Muno, UCLA; Julia Patterson, ARIZ; August Raskie, ORE; Lauren Sanders, WASH; Jocelyn Urias, WSU. Jenna Ewert, COLO, S, 5-10, Antioch, Calif.
Lauren Forte, CAL, MB, 6-3, Tempe, Ariz.
Brooke Nuneviller, ORE, L/OH, 5-11, Chandler, Ariz.
Ella May Powell, WASH, S, 6-0, Fayetteville, Ark. Helena Elbaek, American, So., Opp. Libero of the Year – Marija Popovic, ETSU, So. Kaitlyn Grice, Sr., MB, New Orleans, Valrico, Fla.
Hannah Brister, So., OH, Northwestern State, Paincourtville, La. First Team, School, Yr., Pos. Second Team, School, Yr., Pos. Madison Brabham, Texas A&M University- Kingsville, S/RS, Sr.
Maddy Bruder, Northwest Missouri State University, OH, Sr.
Alexis Cardoza, Cal State San Bernardino, OH, So. Jayann DeHoog, Cal State San Bernardino, S, Sr.
Kasie Gilfert, Colorado Mesa University, MB, RS-So. Kristen Hamlin, Cal Poly Pomona, MB, Sr.
Sarah Kelly#, University of Minnesota Duluth, MB, Sr.
Haley Kramer^, Wheeling Jesuit University, MB, Jr.
Sara Macek, Concordia University, St. Paul, MB, Jr.
Nicole Mattson#, Florida Southern College, OH, Sr.
Katie McKiel, University of Tampa, OH, So. Abby Phelps#, Western Washington University, OH, Sr.
Karli Reichert, Rockhurst University, OH, Jr.
Taylor Reiss#*, Southwest Minnesota State University, OH, Sr.
Rachel Alles, Wingate University, S, Jr.
Bria Barfnecht, University of Sioux Falls, RS, Sr.
Molly Burkhardt, Palm Beach Atlantic University, S, Sr.
Megi Buvinic, Barry University, OH, Jr.
Allyson Cappel, Ferris State University, OH, Jr.
Kayleigh Harper, Western Washington University, MB, Jr.
Sorrel Houghton, University of Tampa, OH, So. Elizabeth Hyland^, Lewis University, OH, Sr.
Brooklyn Lewis^, Concordia University, St. Paul, RS, Sr.
Ellie McDonnell, University of Nebraska at Kearney, L, Sr.
Elizabeth Mohr#, Concordia University, St. Paul, S, Sr.
Stephanie Sylvester@, Wheeling Jesuit University, S, Jr.
Emily Torve, University of Minnesota Duluth, S, Jr.
Megan Treanor, Dixie State University, RS, So. Sierra Bauder, Biola University, MB, Sr.
Bethany Besancenez@, Florida Southern College, S, Sr.
Brette Boesel, Western Washington University, S, Sr.
Olivia Ghormley, Michigan Technological University, OH, So. Phoebe Havenaar, Wingate University, MB, Sr.
Nikki Kennedy#, Regis University, MB, Jr.
Hannah McManus, Tarleton State University, MB, Sr.
Cassie Meyer, Wheeling Jesuit University, OH, So. Morgan Olson, Minnesota State University, Mankato, RS, Jr.
Audren Rose, Barry University, L, Jr.
Drew Stokes, Colorado School of Mines, S, Fr. Paige VanderWall^, Hillsdale College, RS, Sr.
Chase Wassel, Holy Family University, OH, Sr.
Alyssa Woodman, Rockhurst University, OH, Jr.
Sierra Adams, Stanislaus State University, OH, Jr.
Gabrielle Aihara, Central Washington University, S, Jr.
Jennie Anderson, Palm Beach Atlantic University, MB, RS-So. Kalie Arnold, Rockhurst University, L, Sr.
Abby Becker, Lewis University, S, RS-Sr.
Taylor Bevis, University of Central Oklahoma, OH, Sr.
Sara Bisbe, Adelphi University, OH, Jr.
Staci Brower, Grand Valley State University, MB, Sr.
Hailey Busch, Northern State University, OH, RS-Sr.
Christine Carroll, University of South Carolina Aiken, MB, Jr.
Shelley Chapron, Texas A&M University-Commerce, MB, Jr.
Emily Conlin, Anderson University (SC), S, Jr.
Shayla Conner, Washburn University, S, Sr.
Adriana Darthuy, Tarleton State University, OH, Jr.
Julie de Blanck, Emmanuel College (GA), MB, Sr.
Laura DeMarchi, Michigan Technological University, S, So. Sascha Dominique, Cal State San Bernardino, MB, Jr.
Taylor Duryea, Metropolitan State University Denver, OH, Sr.
Viktoria Farian, Seton Hill University, OH, So. Kristina Filimonova, Barry University, OH, Jr.
Audrey Fisher, University of Central Missouri, MH, So. Audrey Fragniere, Angelo State University, OH, Sr.
Alyssa Gage, Southern Connecticut State, MB, Sr.
Lauren Gammell, Dixie State University, MB, Jr.
Zoe Hardin, Harding University, MB, Sr.
Kylie Hohlen, University of Central Missouri, OH, Sr.
Hailey Jackson, Cal State San Bernardino, MB, Sr.
Shelby Kin, The University of Findlay, MB, Jr.
Dolores Kopren, American International College, S, Sr.
Bentley Mara, Drury University, OH, Sr.
Rachael Martin, Florida Southern College, MB, So. Rebecca Martinez, University of South Carolina Aiken, L, Jr.
Allison Maxwell, Washburn University, MB, So. Tessa May, Simon Fraser University, MB, Sr.
Julianne Miller, Azusa Pacific University, MB, Jr.
Kyla Morgan, Central Washington University, L, Jr.
Katie O’Connell, Ferris State University, RS, So. Courtney Place, Augustana University, OH, Sr.
Jordyn Poppen, University of West Florida, OH, Jr.
Jana Potic, American International College, RS, Jr.
Kate Ranes, Texas Woman’s University, S, Jr.
Debra Rogers, University of Arkansas – Fort Smith, MB, Sr.
Ashley Rozell, Northern State University, S, RS-Jr.
Anastasiia Samokhvalova, Barry University, MB, So. Lauren Sampson, Gannon University, OH, Fr. Karla Santos, California State University, Los Angeles, OH, So. Silvia Sartori, Lee University (TN), OH, RS-Sr.
Kendra Sater, Drury University, S/H, Jr.
Camille Smith, Colorado Mesa University, MB, Jr.
Laura Snyder, Northern State University, RS, So. Allison Splitt, University of Illinios at Springfield, MB, Jr.
Aubrey Stephens, Western Washington University, L, Sr.
Eve Stephens, University of Alaska Anchorage, RS, Fr. Santaisha Sturges, Metropolitan State University Denver, OH, Sr.
Jayci Suseland, Millersville University, RS, Jr.
Taylor Svehla, Georgia College, MB, Sr.
Makala Swart, Central Washington University, OH, So. Abby Tiesman, Colorado School of Mines, MB, Jr.
Kassie Till, University of West Alabama, S, So. Leilia To’omalatai, Cal State San Bernardino, L, So. Kira Zimmerman, Cal Poly Pomona, S, Fr. Mady Arles, Emory University, S, Sr.
Tyler Brown! *, Illinois Wesleyan University, OH, Sr.
Maria Coniglio%, Johnson & Wales University (RI), OH, Jr.
Sarah DeVries%, Calvin College, MB/S, Jr.
Nora Holtan! *, Gustavus Adolphus College, S, Sr.
Kate Isaksen^, Clarkson University, L, Jr.
Anna Kamp! *, Calvin College, OH, Sr.
Phoebe Madsen, Claremont-Mudd-Scripps, S/RS, Jr.
Julianne Malek^, Washington University in St Louis, MB, Sr.
Emily Mohs, Thomas More University, OH, Fr. Madelyn Pashibin, University of Wisconsin-Eau Claire, OH, Sr.
Carson VanCampen, Berry College, MB, Jr.
Marybeth Weihbrecht!, Juniata College, MB, Sr.
Hunter Weiss, College of St. Benedict (MN), RS, So. Nicole Ciari, Cornell College, MB, Sr.
Aubrey Cox, Wittenberg University, MB, Jr.
Dejia Danhi, Juniata College, MB, Jr.
Karissa Dzurik, Emory University, OH, Sr.
Brylee Frank^, Johnson & Wales University (RI), S, Jr.
April Gehl, University of Wisconsin-Stevens Point, OH, Jr.
Lauren Schilling, University of Texas at Dallas, MB, Jr.
Lisa Sheldon%, Bowdoin College, L, Sr.
Maia So-Holloway, Carnegie Mellon University, S, Jr.
Margo Spaethling, Colorado College, MB, Jr.
Reagan Stone, Ithaca College, OH, So. Victoria Taylor, Juniata College, OH, So. Ifeoma Ufondu, Washington University in St Louis, OH, Sr.
Karen Wildeman!, Wittenberg University, S, Sr.
Phia Bellizzi, Wesleyan University, L, So. Abby Bertics^, Massachusetts Institute of Technology, OH, Sr.
Simone Bliss, Johns Hopkins University, OH, So. Lizzy Counts!, Colorado College, S, Jr.
Caitlyn Floyd, Ithaca College, S, Jr.
Katie Hobler, Rochester Institute of Technology, OH, Fr. Sarah Jurgens, Carnegie Mellon University, RS, Sr.
Kate Kiser, Bowdoin College, S, So. Madeline McKay, Trinity University (TX), OH, Sr.
Suzanne Peters, DePauw University, OH, Sr.
Brittany Robinson^, University of Wisconsin-Whitewater, L, Sr.
Kate Walker!, Johnson & Wales University (RI), MB, Jr.
Amanda Walker, Claremont-Mudd-Scripps, RS, Jr.
Madison Weiss, College of St. Benedict (MN), MB, So. Linsey Bailey, Roanoke, OH, Fr. Camryn Bancroft, Springfield, MB, So. Emma Bartlett, Brandeis, MB, Jr.
Abby Beecher, Babson, L, Sr.
Megan Behrendt, Carthage, OH , Jr.
Laura Beier, Berry, L , Fr. Rachel Burkman, Illinois Wesleyan, OH, Sr.
Katie Byrne, Juniata, L, Sr.
Elizabeth Cameron, Babson, S, Jr.
Elizabeth Chu, Stevens, L, Fr. Mehra den Braven, Swarthmore, OH, Jr.
Allie Desmond, Stockton, RS, Sr.
Meredith Dignan, SUNY New Paltz, S, Sr.
Jen Donnelly, Springfield, OH, Sr.
Lauren Dwyer, Hendrix, OH, Jr.
Morgan Edwards, Juniata, RS, Jr.
Katy Ehnstrom, Skidmore, MB, Jr.
Emily Eng, Arcadia, L, Jr.
Caroline Flaharty, Bowdoin, OH, Jr.
Erika Foose, Carnegie Mellon, MB, Jr.
Allison Franke, Franklin & Marshall, RS, Fr. Devan Gallagher, Vassar, OH, Sr.
Rachel Gaston, Bridgewater, OH, Jr.
Lauren Gedney, Wellesley, RS, So. Zoey Gifford, Endicott, S, Jr.
Taylor Gilbertson, USMMA, OH, Fr. Jenna Gillean, Mary Hardin-Baylor, OH, Jr.
Emma Griffith, Chicago, S, So. Maci Haddad, Cal Lutheran, MB, Fr. Sara Hain, Stevens, MB, Jr.
Mariah Halvorsen, Northwestern-St Paul, OH, Sr.
Emily Hancock, Berry, OH, Jr.
Caroline Hanson, Marymount, RS, Sr.
Kate Holtan, Gustavus Adolphus, OH, So. Chelsea Huppert, Ohio Northern, MB, Jr.
Steph Judkins, Cabrini, OH, So. Louisa Kishton, Johns Hopkins, OH, Jr.
Miranda Klein, Mary Hardin-Baylor, S/RS, Jr.
Jesse Larkin, Kean, MB, Jr.
Katie Leftridge, Stevenson, OH, Jr.
Katrina Lieberman, Trinity (TX), S, Jr.
Emily Lines, Aurora, S, Sr.
Brittany Luethmers, Gustavus Adolphus, L, Sr.
Hannah Lyons, Susquehanna, MB, Jr.
Grace Maggiore, Franklin & Marshall, S, So. Morgan Malley, Augsburg, S/H, Sr.
Melanie Malseed, Neumann, OH, Jr.
Emma Mancini, Endicott, OH, Sr.
Amber Matalus, Virginia Wesleyan, MB, Jr.
Megyan Merrill, Morrisville State, OH, Jr.
Ellie Meyer, St. Thomas (MN), L, Jr.
Andrea Miller, Otterbein, S, Sr.
Kelsey Milligan, Nazareth, MB, Sr.
Melanie Moore, Claremont-Mudd-Scripps, MB, So. Emma Morgan-Bennett, Swarthmore, MB, Jr.
Lauren Mueller, Carnegie Mellon, OH, Sr.
Sarah Muisenga, Chicago, RS, Sr.
Jenna Mummert, Thomas More, MB, Jr.
Kaira Muraoka-Robertson, Wesleyan, S, Jr.
Elyssa Nicolas, Johnson & Wales (RI), L, So. Megan O’Hara, Christopher Newport, RS, So. McKenna Otto, Hope, MB, Fr. Erin Parkinson, RIT, S, Sr.
Michelle Paulsen, Eastern, MB, Sr.
Madison Pearson, Chicago, MB, Jr.
Katie Piper, Christopher Newport, OH, Jr.
Savannah Powers, Mary Washington, RS, Jr.
Allie Puccio, Babson, OH, So. Yasmine Reece, Wellesley, MB, Sr.
Rachel Reusch, Clarkson, MB, Jr.
Lauren Rewers, St. Olaf, RS, Jr.
Jeneva Salter, Birmingham-Southern, OH, Sr.
Leah Saunders, Emory, RS, So. Jessica Schmautz, Whitworth, OH, Sr.
Kennedy Schmidt, Wittenberg, MB, Sr.
Jillian Schulte, Cornell (IA), S, Sr.
Sydney Schwitters, Northwestern-St. Paul, S, Fr. Isabel Sessions, Middlebury, OH, Sr.
Eileen Shi, UMass Boston, OH, Sr.
Kelsie Sievers, LaVerne, RS, Sr.
Kelsey Smith, Calvin, RS, Fr. Sarah Staver, Middlebury, MB, Sr.
Alea Steigerwald, St. John Fisher, OH, Fr. Hadley Sterett, Otterbein, OH, Sr.
Zoe Strozewski, Kean, MB, So. Madison Surprise, Wisconsin-Eau Claire, S, Sr.
Macey Terhell, Augsburg, L, Sr.
Elyse Thompson, Emory, L, Jr.
Kelly Tornetta, Muhlenberg, OH, Sr.
Sarah Tritschler, Claremont-Mudd-Scripps, L, Jr.
Maggie Viniard, Marymount, S, So. Katie Vondra, Aurora, OH, Sr.
Allison Webb, Washington & Lee, RS, Jr.
Mia Weinland, Williams, MB, Sr.
Victoria Wilson, Bridgewater, S, Sr.
Kara Wright, Dubuque, OH, Jr.
Kayla Yew, Carnegie Mellon, L, Jr.
Taylor Yontz, Wittenberg, L, Jr.